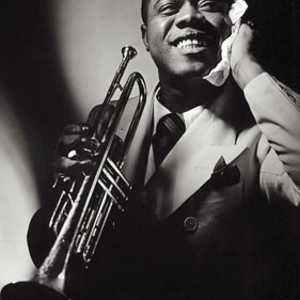 Louis Armstrong (1901-1971) was a trumpet player, singer, and bandleader, and is widely regarded as one of the most influential artists in the history of jazz. Armstrong was born and brought up in New Orleans, a culturally diverse town with a unique musical mix of creole, ragtime, marching bands, and blues. Although from an early age he was able to play music professionally, he didn't travel far from New Orleans until 1922, when he went to Chicago to join his mentor, King Oliver. Armstrong was born and brought up in New Orleans, a culturally diverse town with a unique musical mix of creole, ragtime, marching bands, and blues. Although from an early age he was able to play music professionally, he didn't travel far from New Orleans until 1922, when he went to Chicago to join his mentor, King Oliver. Oliver's band played primitive jazz, a hotter style of ragtime, with looser rhythms and more improvisation, and Armstrong's role was mostly backing. Slow to promote himself, he was eventually persuaded by his wife Lil Hardin to leave Oliver, and In 1924 he went to New York to join the Fletcher Henderson Orchestra. At the time, there were a few other artists using the rhythmic innovations of the New Orleans style, but none did it with the energy and brilliance of Armstrong, and he quickly became a sensation among New York musicians. Back in Chicago in 1925, he made his first recordings with his own group, Louis Armstrong and his Hot Five, and these became not only popular hits but also models for the first generation of jazz musicians, trumpeters or otherwise. Other hits followed through the twenties and thirties, as well as troubles: crooked managers, lip injuries, mob entanglements, failed big-band ventures. As jazz styles changed, though, musical purists never lost any respect for him -- although they were sometimes irritated by his hammy onstage persona. Around the late forties, with the help of a good manager, Armstrong's business affairs finally stablilized, and he began to be seen as an elder statesman of American popular entertainment, appearing in Hollywood films, touring Asia and Europe, and dislodging The Beatles from the number-one position with Hello Dolly". Today many people may know him as a singer (a good one), but as Miles Davis said: ?You can't play nothing on modern trumpet that doesn't come from him."